Grocery shopping is one of those things we all have to do and let’s face it, no one can honestly admit they enjoy it. I’ve come up with a few ideas on how to reduce your shopping time so that you can be in and out as quickly as possible. 1. When doing your grocery shopping make sure you make a list before you leave the house. This will save you time as you won't have to think about what you need. I also find that if I don't do this, I get to one end of the shop and realise I've forgotten something that’s at the other end. You can also make it easier by list things in groups i.e. all fruit and vegetables together and all frozen food together, or in the order that you will find it in your supermarket. 2. Don't take your kids shopping as they will distract you by talking to you, pointing at things and picking things up. So what would have been a 10 minutes shopping trip will turn into at least half an hour, if not more! 3. Try and avoid shopping at the weekend, after the school pick-up and around rush hour because these are the busiest times. Also I’ve often found that at weekends I can never complete my shop as there are always a couple of items they’ve run out of. 4. If you really aren't that bothered about going to the shops yourself, order your shopping online and get it delivered. Lots of supermarkets offer this service these days with home delivery at a time slot of your choice. The chances are this will probably save you money too as you will not be tempted by the smell of doughnuts on the shelf as you walk past! The only downfall to this is you’ll miss out on any reduced items that are priced cheaply because they are near their sell by dates. 5. 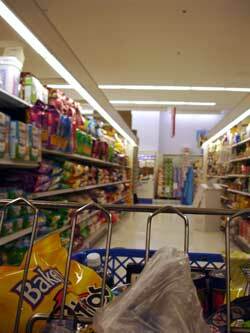 Don’t go shopping on an empty stomach especially if you haven’t decided what you’re having for dinner that night. Unfortunately I have done this many times and find I just end up dilly dallying around not knowing what to get and end up wasting so much time or even worse end up buying something on impulse because I can’t think straight. 6. Last but not least, it goes without saying, when you’re ready to pay for your goods make sure you chose the till with the shortest queue or with people that haven’t done big shops.